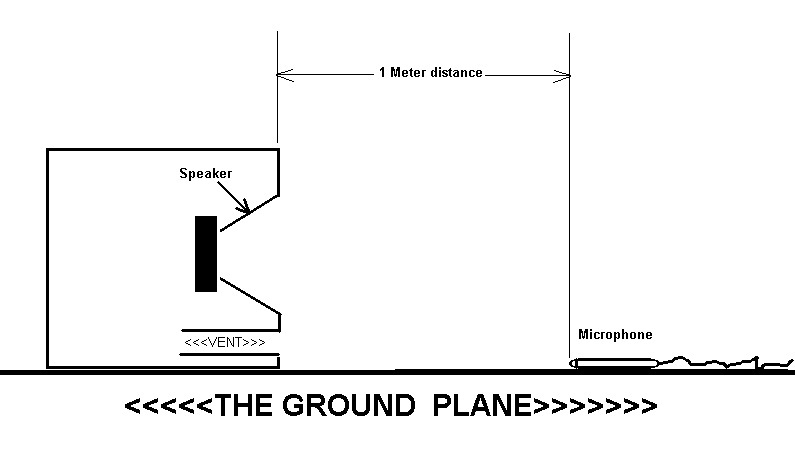 The mic must be on the floor with the capsule touching the floor, pointing at the speaker. Some put a 50 x 50 cm plate of thin glass under the mic to ensure its on a very flat surface. I have concrete floors so don't bother with the glass, but if your on grass or a roughly laid tarmac then you might want to consider the glass. Mic capsule must be 2 meters from the front of the speaker. This is because of the 6dB of lift you get when both the speaker and mic are on the floor. Its called ground plane or half space and you get a mirror image of the speaker, so its like having 2 speakers and when you add another speaker to an existing one you gain 6dB. By putting the mic at 2 meters you are doubling the distance from 1 meter. And as we all know, when you double the distance you lose 6dB (inverse square law). The problem with a mic on a stand in the air above the ground is that it introduces a reflection. You get the direct sound from the speaker to the mic, but also the sound from the ground a bit later. So you have 2 sources of sound not one. If your good, then you can analise the impulse response and see the point at which the refection (sound from the ground) arrives. You can then tell the software to ignore everything past that point, so effectively gating out the reflection. I would think Tony's iasys machine would be able to perform gated measurements. Still easier to have both the speaker and mic on the ground though, and quicker. This is correct, except they got the distance wrong, should be 2 meters and the mic capsule is not touching the ground. I use a B&K mic that has a wider body that capsule, so I wedge the body up with a small block so that the capsule is touching the ground. Yep, a good basic introduction to acoustics, although a bit dated, still relevant. If you need something that covers more of the measurement aspect, then this is a good read. If its a calibrated system, one that comes complete with mic, amp and audio interface, then you should only need to check for calibration every now and again. Clio is one such system that comes with a calibrated mic, you load the mic file into the software, and an amplifier that puts out 2.83V into 8 ohms. So you know that as long as the distance from speaker to mic is correct you will get an accurate sensitivity measurement. If you are using something like Arta, or room response then you are going to have to follow the software's calibration setup. You will most probably be using your own amp and audio interface. For this you will need to use a mic calibrator (pistonphone). 114dB or 94dB at 1kHz are common values to calibrate to. You could just enter the mics sensitivity value, but this is not likely to be accurate enough, so do the calibration with the pistonphone. The problem with this type of setup is that you might move the input pot on the audio interface or amp gain pot. This would put the calibration out. If you can guarantee the audio interface and amp will never be moved or touched, then you only need to check for calibration every now and again. But if you use the amp and audio interface for other duties, then you are going to have to calibrate each time. Most people use speaker measurements just for comparisons, they don't need to know the accurate sensitivity. If your work needs accurate sensitivity measurements on a regular bases, then I would say go for a calibrated system that comes with mic and amp. it will save you time in the long run. Last edit: 4 years 4 months ago by Rog Mogale. Reason: . Does the length of the xlr to the mic matter? if the lead is approx 10m would that be ok? same for the speaker power lead. would a 10m lead be ok? should both leads be as short as possible or is the 10m length negligible? Within reasons the mic cable length does not matter. I've done shows with a 30 meter stage snake then 70 meter multicore to FOH and had no problems. Just make sure that when you calibrate your system that you use the mic cable you will always use. That way if there is a loss it won't show up. Same for the speaker cable. When you calibrate put the 8 ohm resistor wired to a speakon socket at the end of your 10 meter cable, that way you ignore any losses. The only loss then will be the short cable inside of the cab, but don't worry about that. You could use any length speaker cable really as you will be measuring 2.83V at the end of it, but there will come a point where damping factor issues creep in. This will probably start with cables over 100 meters in length depending on the impedance of the load.